But we might as well scratch all that, because Beats Music has my undivided attention — and not just because it’s been all over the news recently. So, why am I suddenly listening? Because Beats Music has mastered the art of branding. You’ll notice in the above commercial that there’s no mention of how the service works or how much it costs. The app’s gorgeous UI isn’t even shown. Instead, the ad tells a story about a utopia for music listeners, weaving in words like “people,” “emotion,” “life,” “humanity,” and “magic.” I don’t know about you, but those are some of the words that come to mind when I think about music. A streaming service can use all of the software and high technology and big data and super scientific “genome projects” that it wants to tailor a playlist to my musical taste, but I don’t want to hear about it. That’s not what listening to music is all about. Beats Music understands that. With its marketing and branding strategy, the company has infused a human element into its service— something that none of the competition has even come close to doing. From the app’s warm red coloring, right down to the language used in the advertising, there’s an emphasis on passion above all else. 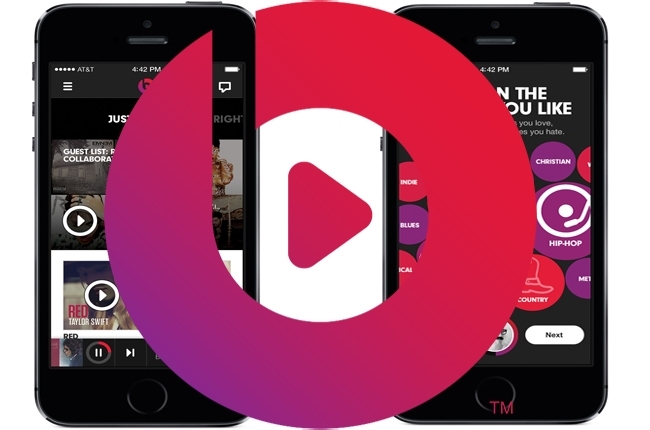 Beats puts a beating heart (pun intended) at the center of music streaming, therefore tapping into the worldview of the music lover. (See: Seth Godin’s book, All Marketers Are Liars) They’ve managed to reconcile technology and humanity and convince us that there are living, breathing humans behind it all. At its core, listening to music is a highly personal experience that makes you feel. What Spotify and others don’t nail on the head is that simple link to emotion. Sure, personalized playlists based on your music taste are great, and there are plenty of services that already do that well. But Beats is promising something more— that it can amplify the emotional experience of listening to music, that it’s made of passion, that it can bring a human touch to online music discovery. That’s a brand.